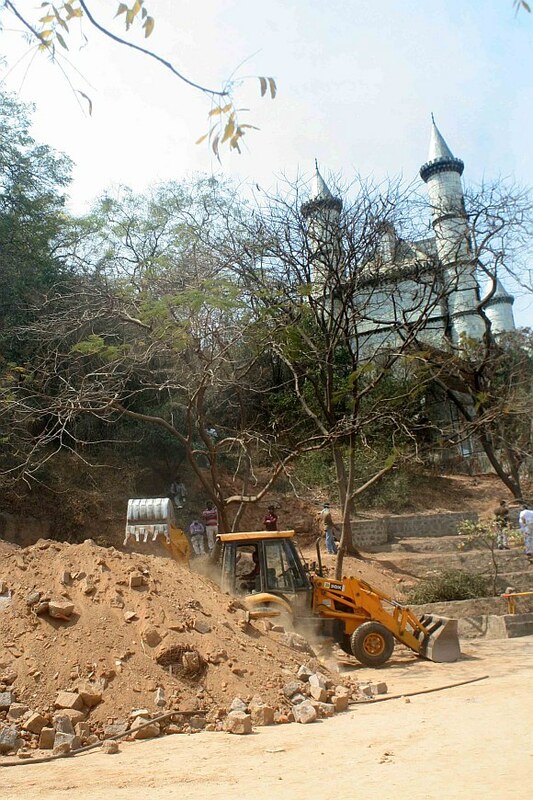 Hyderabad digs for secret tunnel and hidden treasure - Rs 20,000 crore treasure hidden in Hyderabad cave? 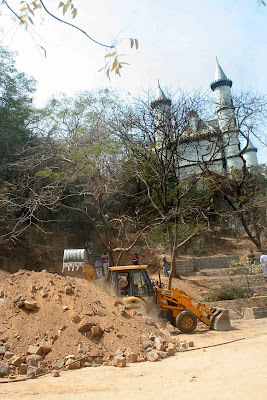 The hunt for a reported treasure trove in the heart of Hyderabad city by the state archaeological department was suspended on Monday afternoon after a two-day digging operation did not yield any results. The search may resume on Tuesday. 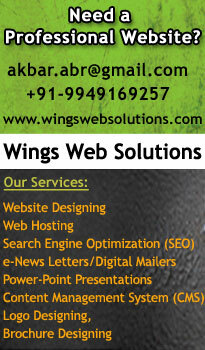 Mohammed Siddique reports. Chenna Reddy, director, AP archaeological department, said that the excavation with an earth-mover machine was suspended as they could not find any signs of a cave or tunnel where some people claimed to have seen a treasure trove more than a year ago. "We have requested the National Mineral Development Corporation to provide us sophisticated geological sensor equipment to pinpoint the location of an underground tunnel," he said. 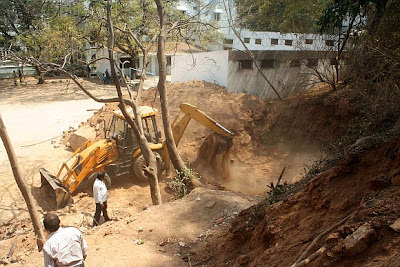 A team of officials of NMDC visited the site of the excavation in a private school premises in Saifabad area of Hyderabad which is bang opposite the state secretariat. The NMDC was likely to send a team of experts with equipment to help in the search operation on Tuesday. The archaeological department personnel started the digging operation at the bottom of the famous Naubat Pahad from inside the school premises on the basis of information provided by a group of nine people including D S Rama Raju, a Coal India Ltd official. They claimed that a cave was present in the school premises and there was a treasure trove inside. The group also claimed that the treasure was worth Rs 20,000 crore. The written representation of the nine people was based on the information provided by Mallesh, a mason, who reportedly saw the cave and the treasure four years ago. 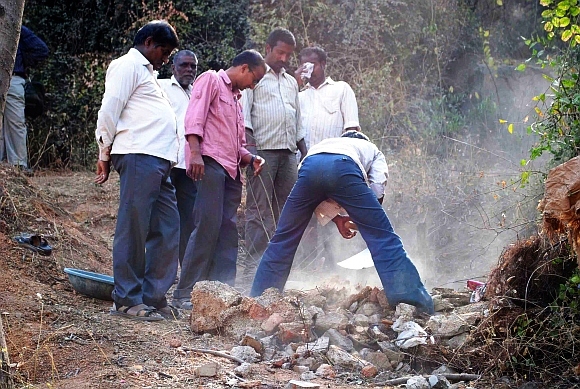 Mallesh claimed that he had spotted the cave during the construction of a compound wall. He also claimed that when he went up to the iron gate on the mouth of the cave, he saw two cupboards full of valuables. "But I kept quiet fearing for my life", he said. Reddy said that the department decided to take up the excavation as it was necessary to verify the information provided by the people. The group demanded that if a treasure was found, they should be given 20 per cent as per the Treasures Act. However, other historians and conservation activists have expressed serious doubts about the veracity of such claims. The Vidyaranya School, where the digging took place is run by the family of the ruler of the erstwhile Wanaparthy Samsthan or Raja Rameshwar Rao. The same building was Rao's residence since 1931 until his death, and was known as Green Gates. City historian Mohammed Safiullah says that it was possible that a cave or tunnel was present in the premises as it was a tradition among the rich, especially during World War II amid fears that Japan would bombard Hyderabad, since the Deccan state was supporting Britain's war efforts. But Anuradha Reddy, convenor of Indian National Trust for Art and Cultural Heritage, ridiculed the claims of a treasure trove or a cave. Anuradha, who is also a relative of Rameshwar Rao said that she had visited the place several times during her childhood, and said that it was an open ground with no fencing or wall. "Anyone could have spotted a cave if it actually existed", she said. The family was unhappy that the officials did not take their permission before barging in the school and digging up the ground. Sajjad Shahed, another conservationist and an expert on the city monuments, expressed his surprise that those claiming to know the treasure trove were silent for such a long time. "The probe should start from these people. Why did they keep the information with them, and why have they gone to the authorities now," he said. 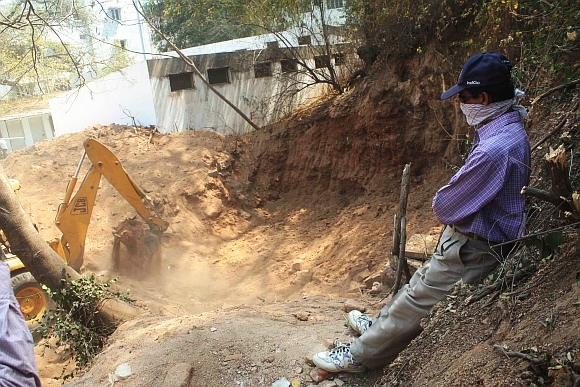 The state archaeological department had launched a similar treasure hunt in nearby Home Science College after it received the information about a tunnel there. Though it could unearth the tunnel with the help of NMDC last year, no treasure was found.